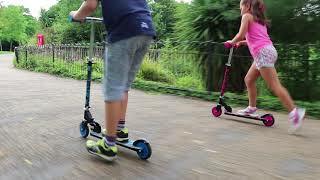 The bopster 2 wheeled folding scooter is a children’s kick scooter designed for the school run or trips to the park. With a lightweight (2.8kg) robust frame and a 4-height adjustable handlebar, these scooters are ideal for children ages 5-14. A 135˚ handle-bar turning angle, 120mm PU wheels with ABEC-5 bearings ensure a controlled and smooth ride. 4 new ‘bopster exclusive’ designs and supplied in retail packaging.